BUFFALO, NY– Building America, a subsidiary of the AFL-CIO Housing Investment Trust (HIT), today announced $9 million of New Market Tax Credits (NMTC) for Northland Central, which includes a cutting-edge facility that will annually train 300 local workers to fill quality jobs in the modernized manufacturing sector. Another $5 million in NMTCs will come from the National Trust Community Investment Corporation (NTCIC). Lt. Governor Kathy Hochul addresses the crowd. At a press conference today, Building America was joined by the project sponsor, Buffalo Urban Development Corporation, Western NY AFL-CIO President Richard Lipsitz, Jr., Lt. 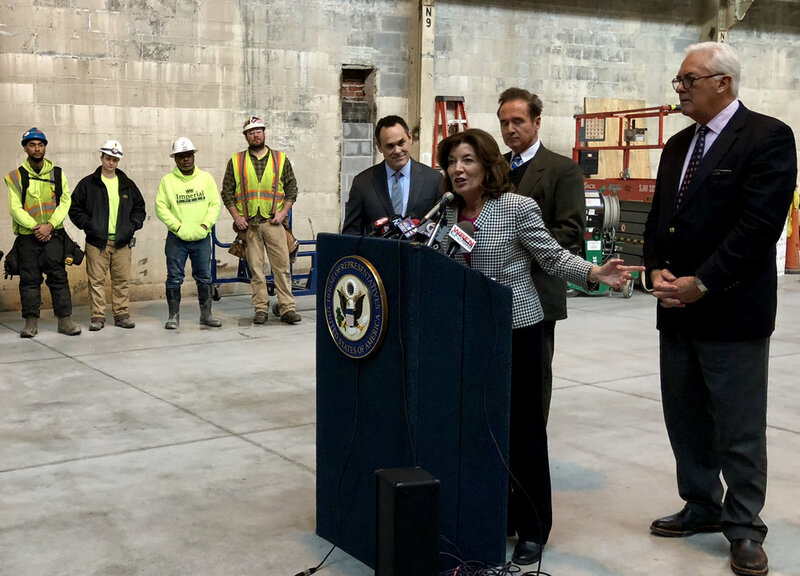 Governor Kathy Hochul, Rep. Brian Higgins (NY-26), HIT Vice Chairman Jack Quinn, and other financing partners in making the announcement at Northland Central. Rep. Higgins praised the NMTC program, a federal initiative that encourages the investment of private equity in community development and economic growth in distressed communities. Mr. Quinn, who held the NY-26 congressional seat from 1993-2005, was instrumental in bringing Building America to the project. Erie Community College, where Mr. Quinn served as President from 2008-2017, is providing educational staff and curriculum to the workforce training center. The Northland Workforce Training Center, located at 683 Northland Avenue in Buffalo, will reuse part of a historic vacant industrial complex and serve as an anchor for the broader Northland Central project. Approximately 93,000 square feet of the 240,000-square-foot building will be used for the training center. The center is expected to create an estimated 329 union construction jobs, as well as another 69 new positions, while retaining 124 permanent jobs in management, counseling, administration, faculty, building operations, maintenance and security. There is a 30 percent local hiring requirement and up to 20 low-income residents will be accepted into the Building Trades Pre-Apprenticeship Program. Once completed, workers will be trained at the center for entry-level operator jobs in machinery, welding, transformers and other positions. “We are investing in the future of America, and that future begins here in Buffalo. The first solar roof tile manufacturing started here just last month, and Northland Central is the key to a skilled and trained workforce for cutting-edge efforts like that,” said Ted Chandler, HIT’s Chief Operating Officer, who noted that in 2013 Building America committed over $9.2 million in NMTCs toward Roswell Parks’ Clinical Sciences Center.